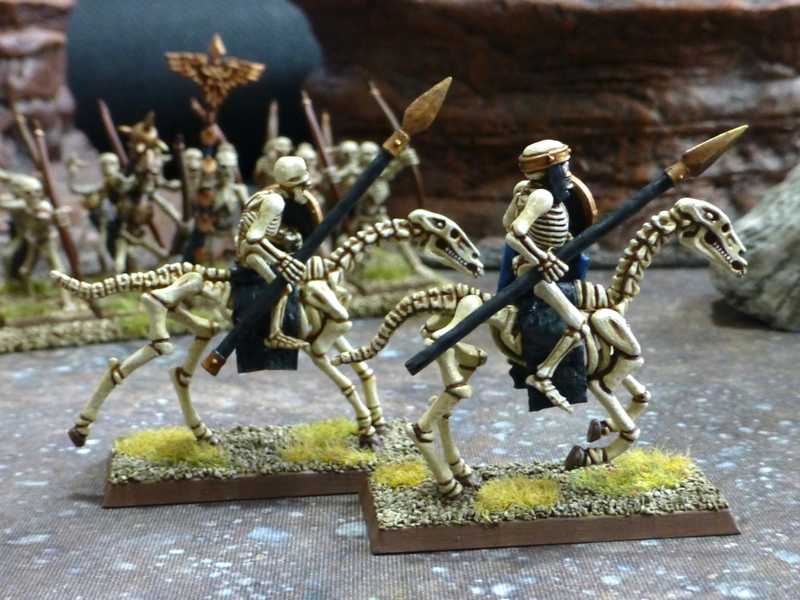 I don’t enjoy painting undead horses much more than life ones hence I had kept back the cavalry and chariots. 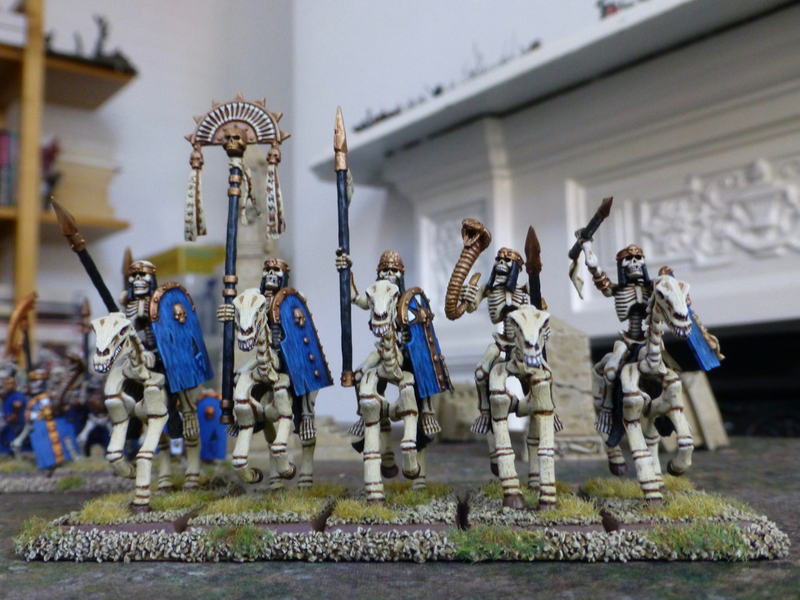 The first five of a ten strong regiment of horsemen with thrusting spears are now finally done and I’ll keep working away on the second half interspersed with various other projects. 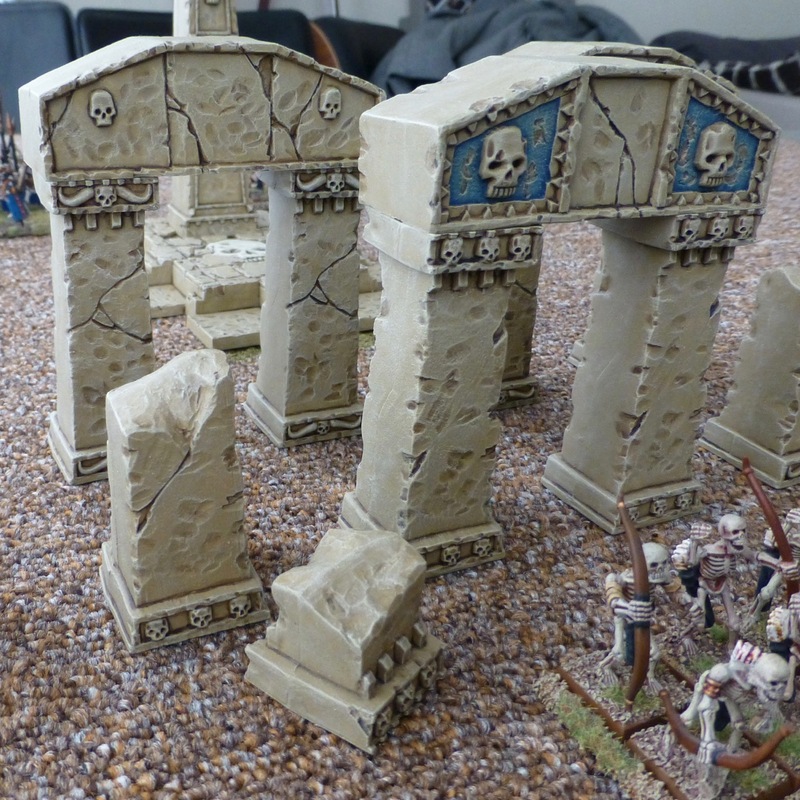 I’ve had the temple kit from Citadel sitting around for a while, undecided on the style to paint it in. 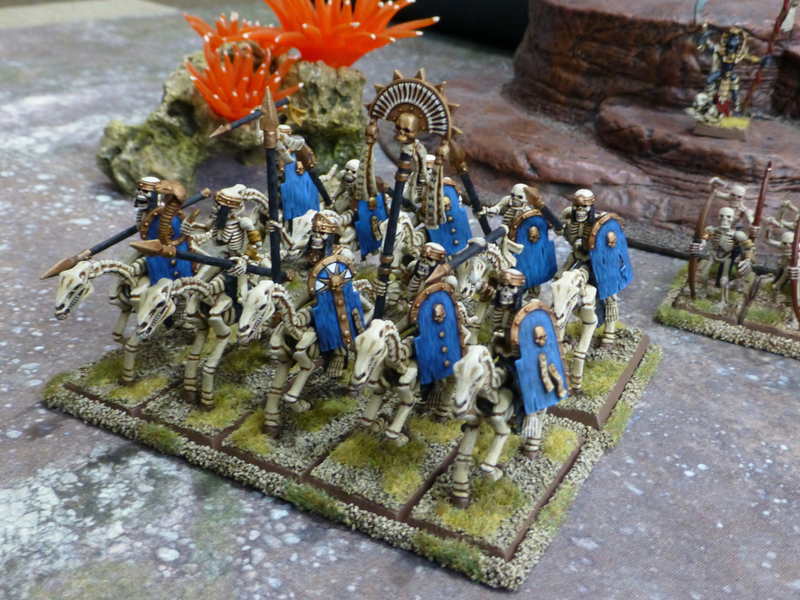 Now working on my Tomb Kings for Warhammer Fantasy Battle again, it seemed like the perfect opportunity for creating a set of army specific terrain. 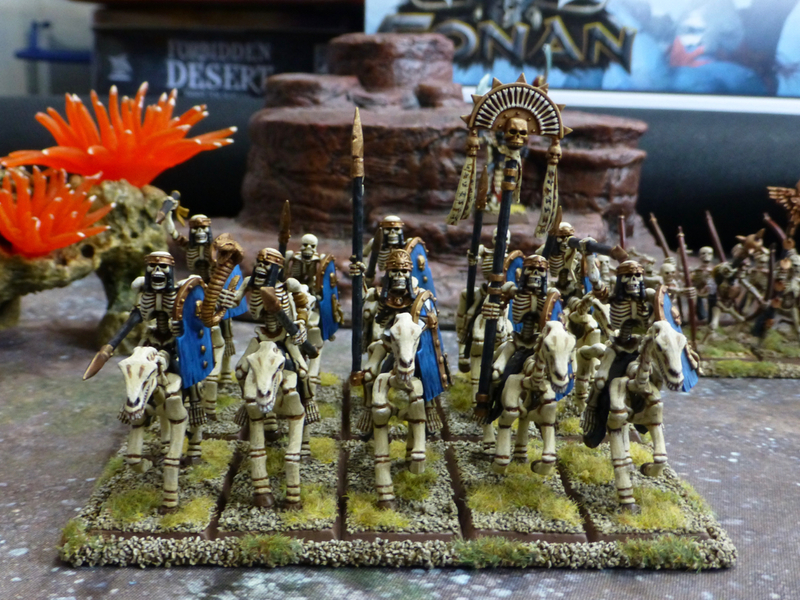 The only paints I used for the sandstone are Zandri Dust, Agrax Earthshade (pure and watered down) and Screaming Skull (for drybrushing). I left everything as single pieces to allow maximum flexibility in terms of layout. 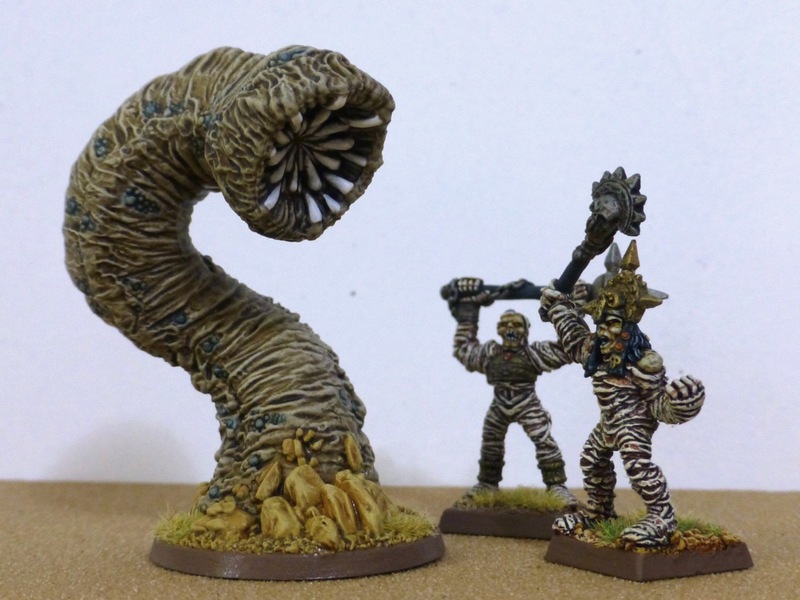 There is enough stuff in the kit to khemrify a whole battlefield, and it can also be used for dungeon crawling and skirmishing in and around. 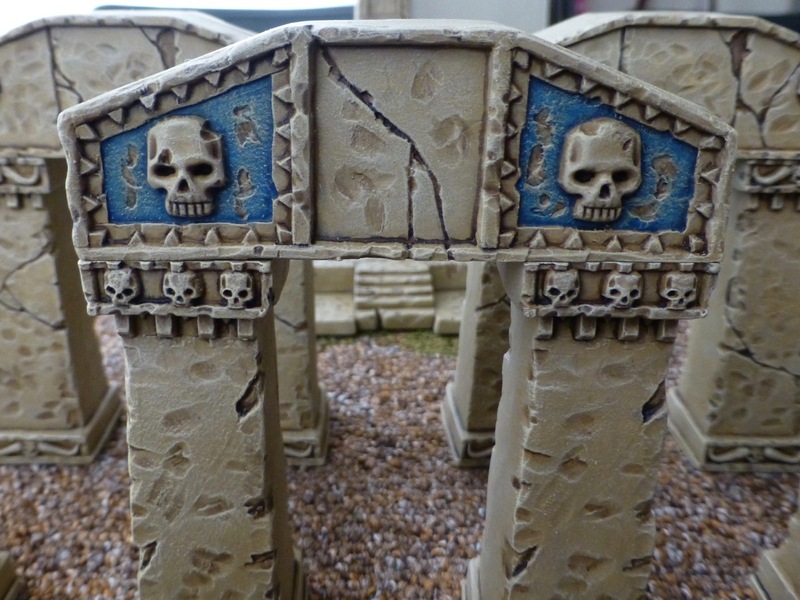 I wanted to add a few faded spots of colour to both hint at the past grandeur of what are now desolate ruins and to tie the terrain in with the theme of my army. 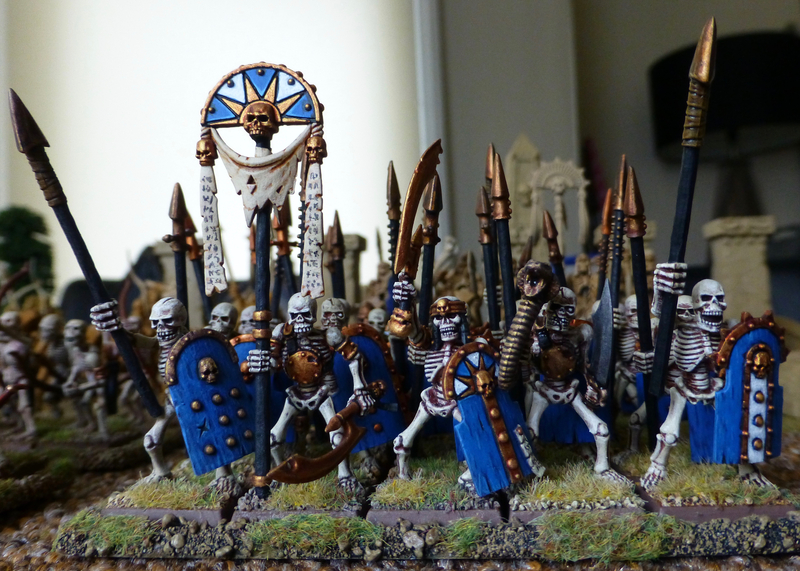 I picked the blues from the shields in the Skeleton Warriors regiment (Kantor Blue and Enchanted Blue) and drybrushed over them in the same sandstone tones as for the rest of the piece. 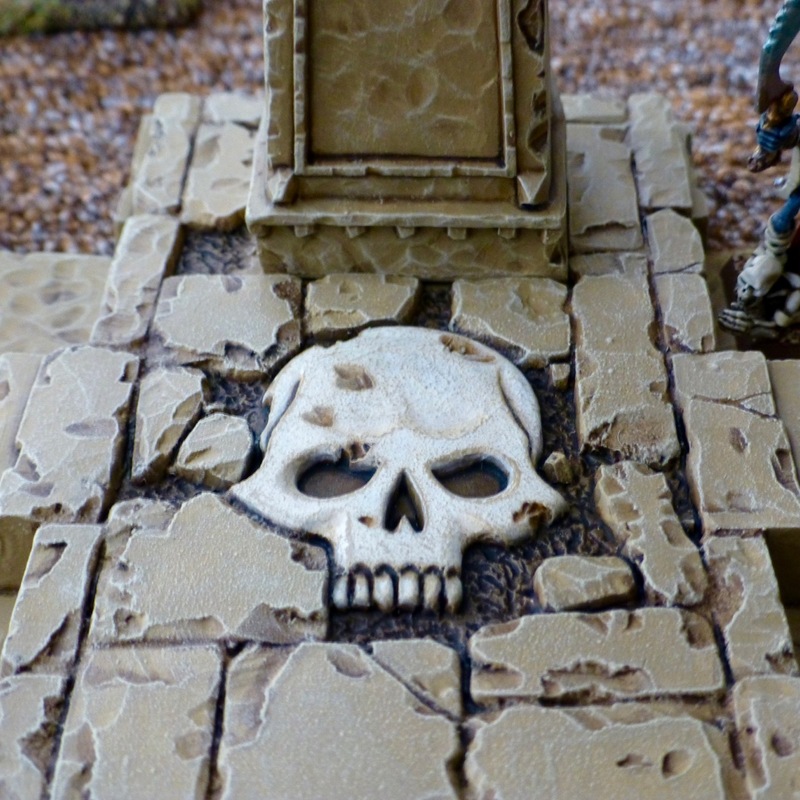 To pick out the inlaid skull on the floor of the temple I painted it in white, applied some light washes in the recesses and then drybrushed over the top with sandstone. 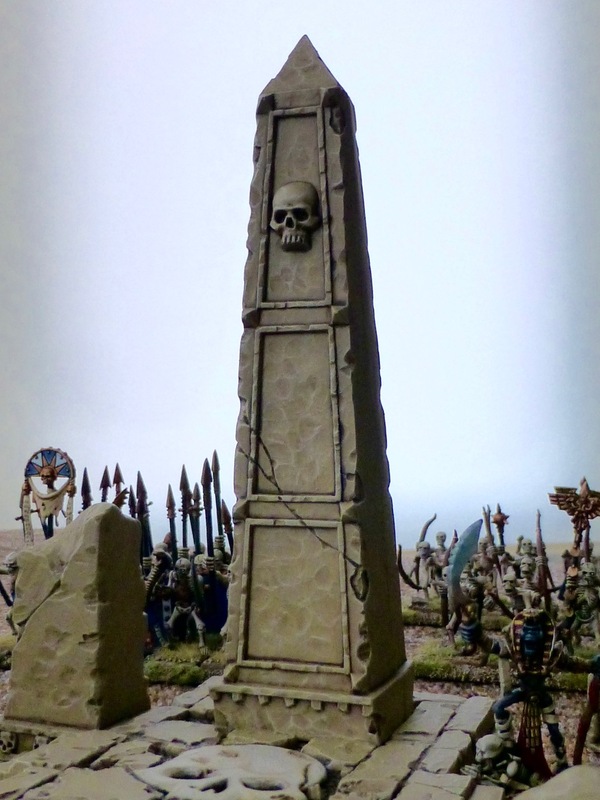 The obelisk I painted in the same way as the other columns. There is the potential to pick out individual areas separately. The top for example could be bronze or golden and the panels painted. 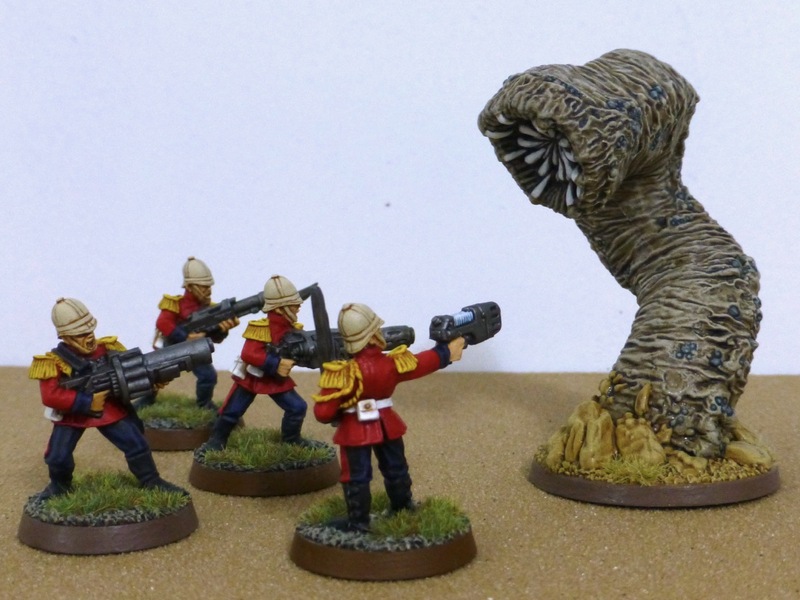 I’ll wait until other core elements of the army itself are finished before making any such additions, since I am undecided on whether to introduce another colour like dark red to its theme, maybe to indicate some units’ elite status. 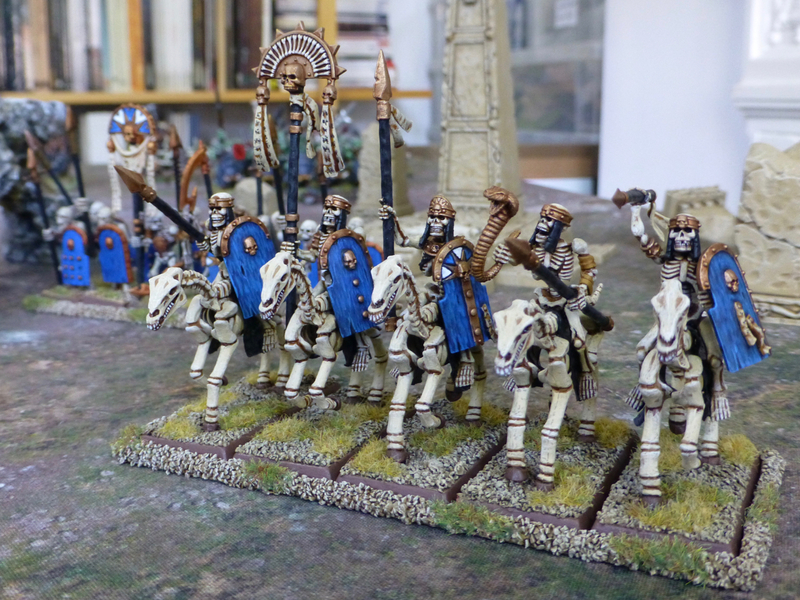 I’m revisiting my Tomb Kings for Warhammer 8th Edition, and my plan for this year is to finish painting a core of infantry, cavalry and chariots plus some accompanying scenery. Additional motivation for this project was provided by the excellent BBC documentary series Immortal Egypt which is now on the iPlayer to catch up on. 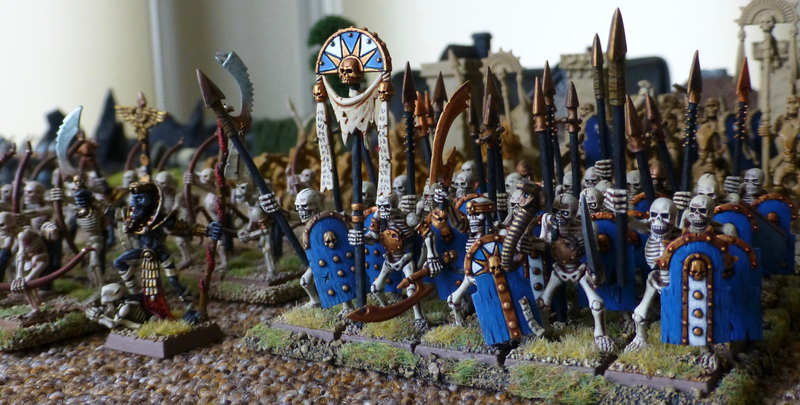 Some years ago I raised a regiment of Skeleton Warriors with simple base colours and drybrushing which I’m improving gradually by applying additional highlighting. 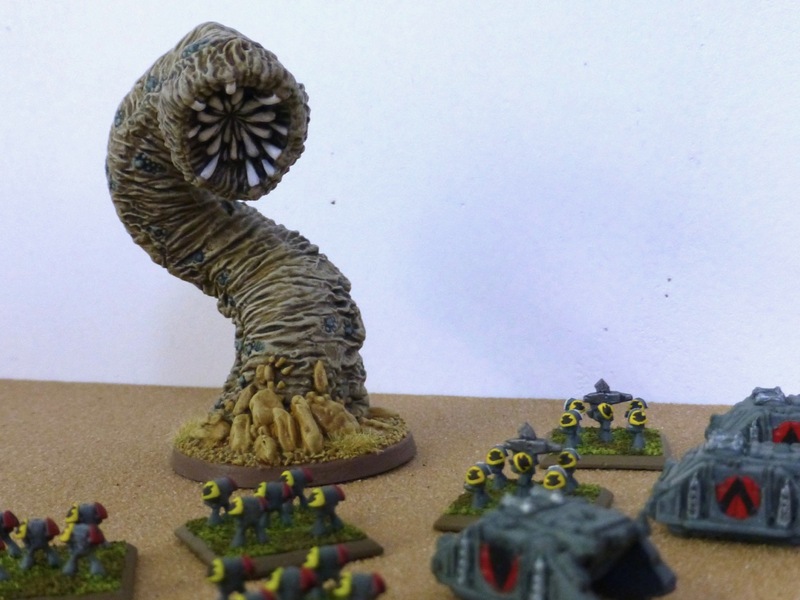 I’ve done that so far on the first rank and am now happy with the overall look of the unit. Eventually I’m hoping to revisit the rear ranks as well, but first I want to make progress on the new elements of the force to get them all to a battle worthy state. 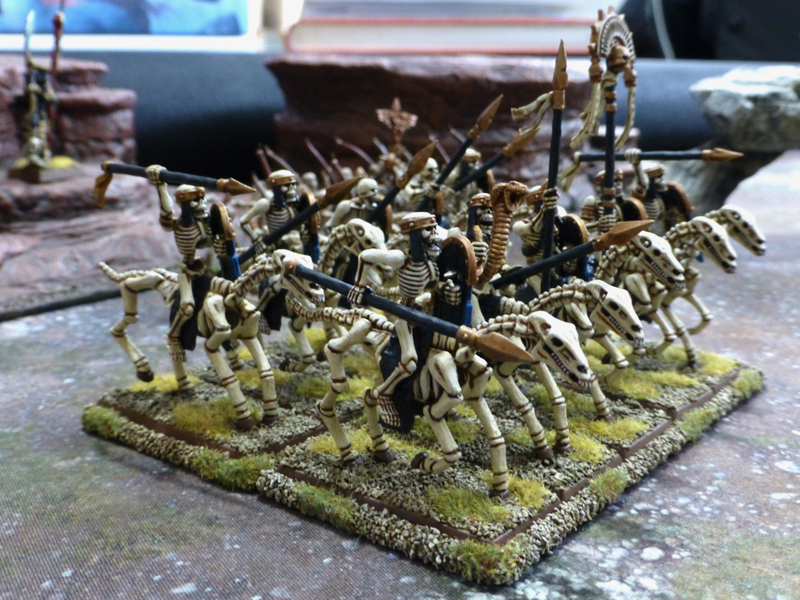 Also part of the force already are two units of Skeleton Archers and a Liche Priest that I bought second hand, painted to a nice standard as a bonus. 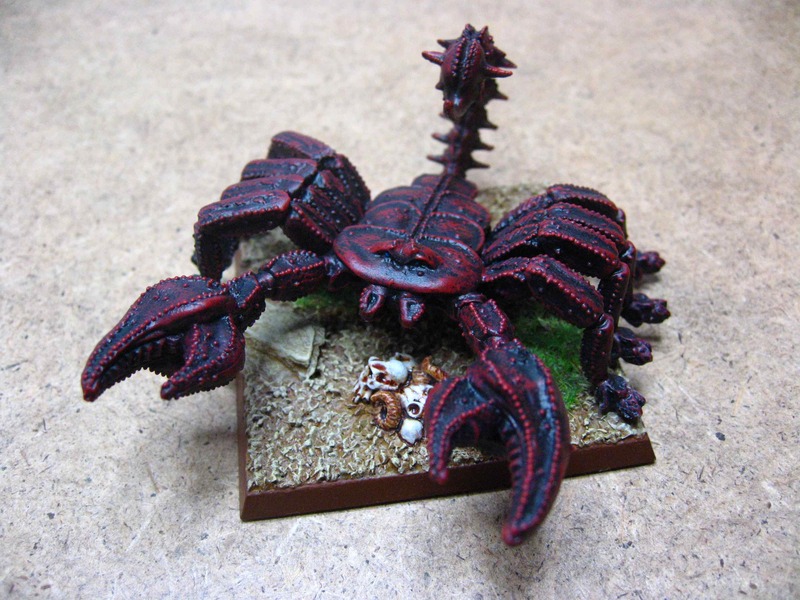 A new life (of sorts) for the classic 80s Citadel Giant Scorpion as a Tomb Scorpion for the Tomb Kings army.